We are pleased to announce a call for application for the ‘3rd NASO Women in Science Award 2019’. The award will be distributed in two categories: student and professional respectively. The winners will receive cash prizes, certificates and trophies during a function in Kathmandu later this year. Interested students or professional can submit their application until February 27, 2019! Click Here to submit your application. If you are a student or professional working on science and woman, we strongly encourage you to apply for this award. 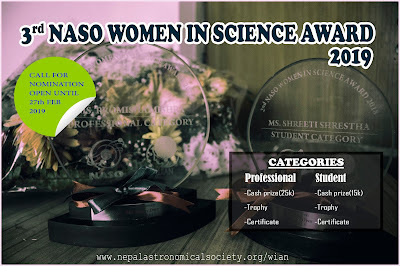 The basic idea behind the creation of this award is to identify and acknowledge the contribution that women are doing in the field of science and technology in Nepal. We started Women in Astronomy Nepal (WIAN) in 2015 within NASO in order to create a unique platform for all the women working in science. We believe this award will add more enthusiasm and encouragement among the women who are working in science. The awards were given to Dibya Ghimire (student) & Praynita Karki (professional) and Shreeti Shrestha (student) & Promosha Mishra (professional) in 2017 and 2018 respectively. Feel free to share this opportunity among the women around you!